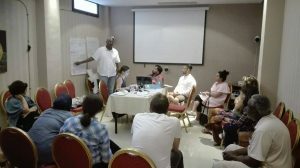 From 19th to 22nd of July RISE Network members went to the island of Lesvos for a study trip in order to witness and enhance their knowledge regarding the living condition of refugees in the so-called “hotspots” of Europe through meeting and exchanging with different initiatives and asylum seekers. 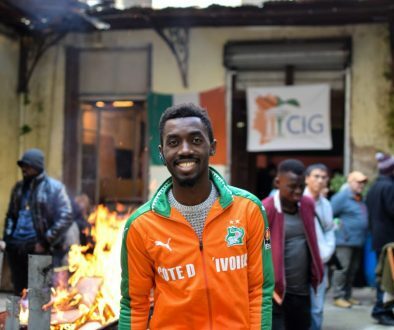 Based on the gained experience and refugees testimonies, the RISE network wrote a statement calling upon the EU to stand up to those challenges and address them in accordance with the values and principles that the EU was built upon. The study visit was linked with an internal-network workshop where the members had the chance to revise their designed activity plans and to brainstorm on new ideas to strengthen the structural organization of the RISE network. The members of RISE started with an opening session aiming at giving an overview of the situation in Lesvos, explaining the purpose of the network visit in Lesvos. 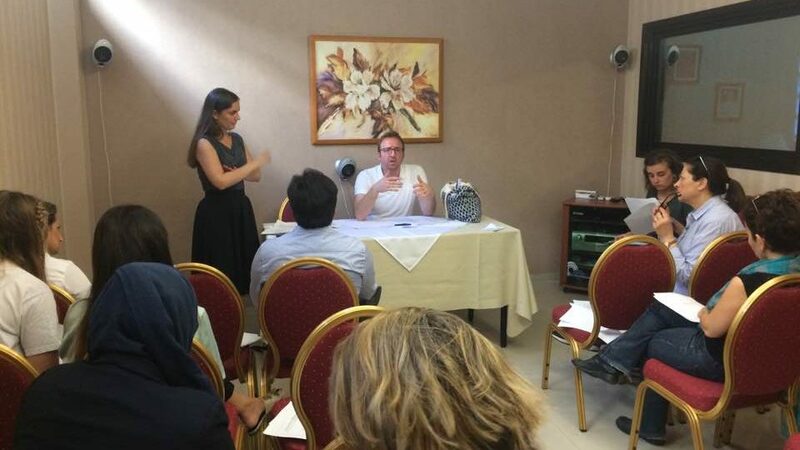 It was followed by a brief presentation from ECRE and the Greek Forum of Refugees that analyzes the situation resulting from the EU-Turkey Deal focusing on its consequences for asylum seekers in Europe. Further, some statistics about the arrivals in Lesvos from 2015 to 2017 were presented. 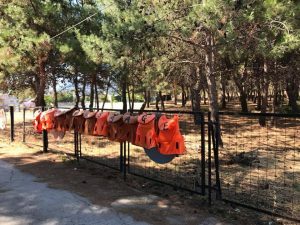 Finally, a focus has been made on the fact that from the 1st of August on the funds that were provided to NGOs and humanitarian organizations will be sent directly to the Greek state. Since there is no transition plan proposed by the government until yet, representatives of different humanitarian organization raised concerns regarding gaps of medical, legal and social provision that most probably will appear. 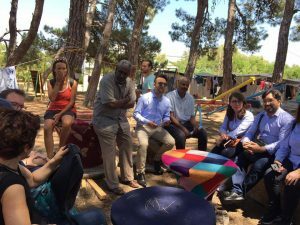 The first visit of the network took place at the Pikpa community centre (Lesvos Solidarity – a local activist group from Lesvos). There, Amnesty International introduced the Refugee Action Lab. The members had the opportunity to present the network, by briefly presenting its objectives and the actions that have been achieved. This presentation was followed by a projection of a collections of shorts films on the situation at different country borders. These films have been recorded by the photographer George Moutafis, his words had a strong resonance for the Rise members: “The images can shock, at the end, it’s not the images that are shocking but the situation and the fact that this is happening”. Pikpa members took time to introduce the network members to their project, their history, values and also integration strategies that are being put into place with the participation of local people. There was the opportunity to talk with a nurse working every day in the centre as well as with the residents. The RISE members had the opportunity to better understand the daily situation of refugees on the island thanks to the exchange with field-based workers and refugees themselves. This way, they could also better appreciate the essential work being undertaken by PIKPA. 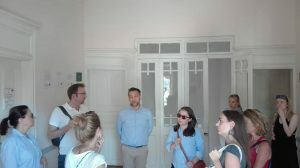 Afterwards the network visited the Mosaik community support center in Mytilene, which is a collaborative project also run by Lesvos Solidarity and Borderline-Europe. 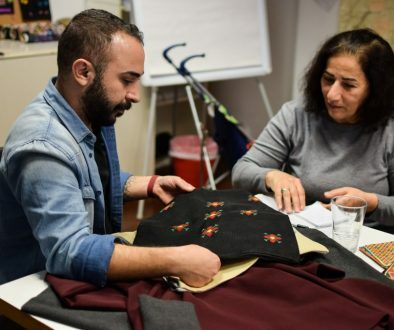 The principles of Mosaik are based on solidarity, integration and empowerment of refugees. A member of the center presented the vision, objectives and activities of Mosaik, showed the spaces they run and stressed the importance of including the local population in their activities. The RISE network members had the opportunity to exchange with visitors and learn about their lives and challenges they are facing. Pikpa and Mosaic have been a real inspiration for the RISE network. 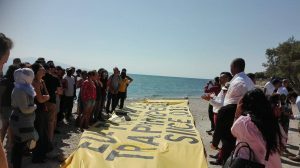 Its members had the chance to know better “grass root” projects and discover more initiatives aiming at supporting refugees in the different needs they face after arriving on a Greek island. Based on the visits, they started to write a common statement to be published by the end of the study visit. 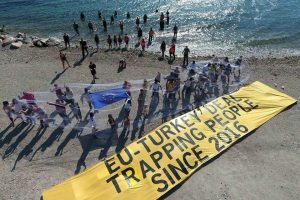 On that morning RISE joined the Joint Action of Amnesty International- “EU-Turkey Deal, Trapping people since 2016”. 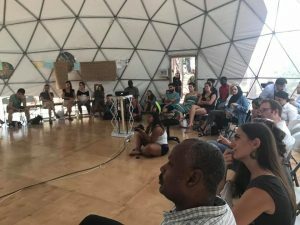 It was an opportunity to network on a national level with other active groups based in the same country as RISE members, as the event involved activists living in different European countries. After that, the members met to make an evaluation of RISE in order to work on improvement for the network and its development. Adjusted objectives were suggested, focusing more on capacity building, sharing knowledge, networking and advocacy. The main outcome of this meeting was a common agreement on building three groups within RISE: a communication team, a structure of the network group and the action plan group. Through sharing of specific tasks, the network will be able to conduct even more effective actions resulting from the strategy defined. On the last day RISE members released their common statement. All of them agreed to make heard in their countries the voices of the refugees that are now trapped in an open-jail in Lesvos. This could help disclosing widely the consequence of the disastrous EU-policies they have witnessed in Lesvos.